I was travelling at the tail-end of the rainy season and hoping I might miss the heavy downpours. No such luck. The helicopter trip from Siem Reap, overhead Angkor and on towards the Thai border was in bleak light and steady drizzle. Because of the weather, air traffic control suggested we head directly north and skip the diversion to Angkor Wat. I looked across at the pilot Phil. “Let’s at least have a go,” I said. He nodded. There was low cloud and swirling mist but as we neared the monument, the haze cleared. For a few seconds I had a straight shot of Angkor Wat’s classical lotus flower-shaped towers. Those few snatched moments were enough to create a translucent layer of aerial imagery -- beneath a map of my route -- for the final package. Our flight continued towards the northwestern border with Thailand where Phil dropped me off at a temple called Banteay Chhmar. We landed in a muddy field and the rain set in. This was to be my wettest time in Cambodia -- and I was camping. That first night I could barely sleep for the thunderous storm overhead and hard relentless rain. I ended up cradling my camera within my sleeping bag to try to protect it from rain leaking through the canvas and rising waters penetrating upwards through the ground sheet. By morning I was sodden but the camera was functioning if a little damp. When the sun briefly came out I turned my tent inside-out in an effort to dry out the rest of the equipment. Filming the temples themselves was straightforward. In wet weather the stone had an attractive glossy sheen although the flat grey light did tend to deaden the shots. At any sign of sun I tried to catch the play of light and shadow in an effort to bring life to the 1000 year-old statues and bas-reliefs. More of a challenge than the weather were the officious temple guards who put a stop to any filming when they saw the size of my camera (and I was without paperwork). But since my story focused on remote sites away from heavily-guarded tourist attractions, I managed to get the key shots. In fact Banteay Chhmar temple had no guards whatsoever. Or any tourists. At the first temple I visited -- Prasat Ta Muen Thom, immediately on the border with Thailand -- they told me I was the first tourist in nine years. The only people there were Thai and Cambodian soldiers milling around: eating fried rice, playing cards together, smoking. They were far more surprised by my visit than suspicious of my camera. The rain -- and flooded roads -- did prevent me from travelling to some temples I longed to see including Preah Khan Kampong Svay and Preah Vihear. I promised myself to return. Recent cross-border fighting -- and casualties -- at Preah Vihear may force me to wait. 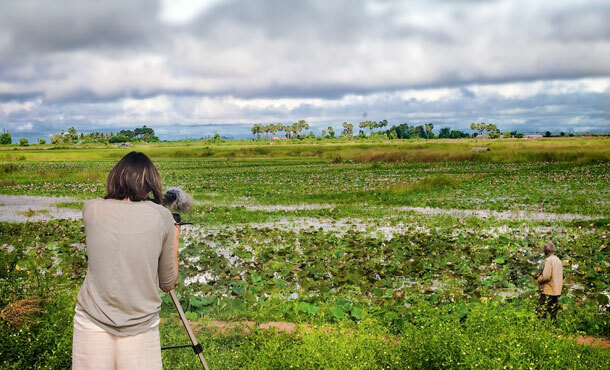 During my last few days in Cambodia I was filming GVs of lotus flower fields and had zoomed in on a wrinkled old man waist-deep in water gathering blooms. My romantic side imagined him plucking the flowers for his elderly wife. Instead he approached me with the bouquet, pushing it towards me and putting out his cupped hand for money. Fair game. He got his money and I ate lotus flower seeds all afternoon.